Kitchen | How can I recycle this? 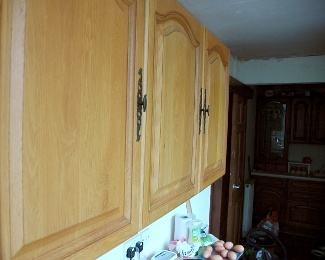 Reduce This: How can I revamp an old kitchen so I don’t need to buy a new one? Yesterday, I posted a question from James, asking for ways to reuse or recycle a whole kitchen, because he’s getting a new one. Thanks to everyone that has commented about that! Our kitchen is also 15+ years old, is looking rather tired (especially as half the kitchen has one cupboard design, the other half a different one) and the far end is generally pretty dark (as is obvious in the picture!). We did a few things to freshen it up when we moved here two and a half years ago such as repainting the walls a more neutral shade and replacing the very scuffed, dark green hob & sink with lighter alternatives (thanks eBay for second-hand bargains for both!). More recently (as this week – it’s still drying), we’ve had the nasty grease-attracting spiky artex ceiling reskimmed so once painted, that’ll look fresher and as well as redecorating again, we’re going to add some tiled splashbacks (since there aren’t any at the moment – mucky walls a go go!). We’re hoping to find a replacement for the badly fitted dark vinyl flooring too and improve the lighting somewhat. Will it be as nice as a new kitchen? No — but it’ll hopefully be good enough and more practical so we won’t need to decorate again for a good while (I hate decorating). I don’t think I have the skill or space to do an adequate job of repainting the cupboards (which would make the mismatched doors more uniform) but I’m hoping everything else will freshen it up enough. 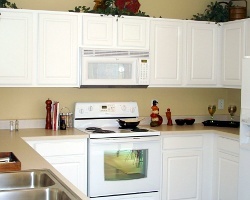 Have you revamped an old kitchen to save replacing it? Do you have any tips or suggestions? Did you include any reclaimed, recycled or upcycled elements in your “new” kitchen? I’d love to hear your stories for inspiration! We shall be replacing our kitchen in the next few months. The present one is 15 years old and is perfectly serviceable. I don’t want to “skip” it. Any suggestion as to how I can recycle it? My first suggestion would be to try to pass it on – lots of people would love a kitchen revamp but can’t afford to go the whole hog so just replace cabinet doors etc. I regularly see sets of door & drawer fronts offered up on eBay, Gumtree or Freecycle/Freegle (and probably Craig’s List in the US). 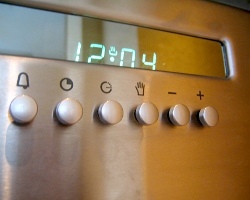 Built-in appliances can be sold/passed on separately too as they often expire before the rest of the kitchen so people might want to replace just those bits. People don’t just use them for revamping their own full kitchens either – someone might want to make a “tea station” at a community venue, or for storage in a porch/understairs cupboard – so if you’ve not got a lot, someone still might want them for that sort of thing instead. And tatty but still usable cupboards and worksurfaces are still useful in places where function very much trumps form like a garage, cellar or shed – and old sinks are often useful in those places too. We recently covered ways to reuse old ovens (and toaster ovens) too so again, people might want those for non-culinary pursuits where aesthetics are less important. As for more creative reuses (rather than just reusing stuff for its original purpose), I’ve made oversized planters from wooden cupboard doors before, I’ve seen people making pretty serving trays from doors and Alison Bailey Smith curated an art project last year where people used her old kitchen as art materials. Any other suggestions for ways that James could recycle his whole kitchen? Have you given away an old kitchen – or got one from someone else? Any tips? 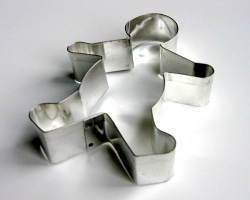 How can I reuse, recycle or upcycle biscuit/cookie cutters? How can I reuse cookie cutters? Other than as soap molds. First things first, it has to be said: do consider passing them on if they’re still in usable condition so other people don’t have to buy new. Charity/thrift/op shops will probably take them to sell on, as would many schools/community groups for use during bulk cooking sessions for special events. Now some onto reusing/upcycling ideas: just yesterday I saw someone using little cookie cutters that they’d got in Christmas crackers (& the like) for cutting out salt dough buttons and cute pedants/jewellery – I guess that’s not really that different to the original biscuit cutting idea but is a crafty rather than culinary angle. Decent size metal cookie cutters can be used to shape fried eggs – stop them from stretching out right across the pan. We’ve got a round one that’s standard English muffin size so we can have round, deep fried egg muffins for breakfast – yum! (Warning: they do get hot while frying! They cool down quite quickly once off the heat but take care if you try this!). Or you/kids could use them as stamps for painting. Any other ideas for ways to reuse them? 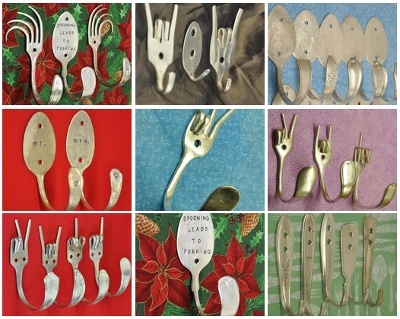 Last week’s post about those little plastic spoons you get with children’s medicine reminded me of all the great things you can do with old metal cutlery – not the finest family silver necessarily but the stuff that manages to find its way into your cutlery drawer (or conversely – the remains that are left after everything else leaves and you get a new set!). 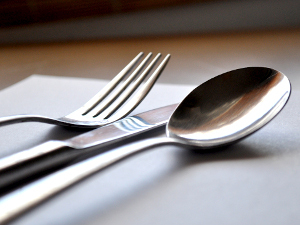 Our cats have a dedicated old fork for their food; I have an old dessert spoon with a handle bent up at 90° for skimming misc and oil from the top of sauces; and, I have an old tablespoon in with my laundry stuff for spooning in wash boosters. In our tool kit, we have a fork which can be used for holding nails in place while hammering, a(n admittedly more flexible than most) old butter knife for smoothing filler and several old spoons for stirring filler, paint and whatnot. What do you reuse them for around the home? They’re almost equally as useful in the garden too! Forks are useful when transplanting seedlings – use them to lift the plant’s tender new roots out of their starter tray – and can also be used to temporarily pin thin runners in place if you want, for example, strawberries, to spread in a certain direction. Knives and spoons also make fun row markers or plant labels in pots. Some people (like dkshattuck, who made the ones above) sell ready made sets for herbs , stamped with the names or otherwise labelled so they’ll last for years and years. 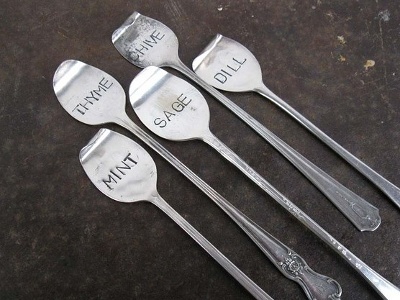 Do you use old cutlery in the garden? If so, what for? Sturdy cutlery can be bent into fun coat hooks or key hooks like those pictured above. They’re by Jeremy and Jen Evensen, who sell via Etsy – such fun designs!